EA's long-running street sports franchise gets a much-needed overhaul with the release of FIFA Street 3 on the Playstation 3. The game's action-packed play emphasizes speed and skill thanks to its new Gamebreaker mode, which enables players to perform some pretty spectacular moves for a brief period. FIFA Street's standard play has also been improved with better-feeling controls and a faster overall pace. Superb production values with cartoonishly animated players make this a more accessible and visually dynamic title. With its arcade-style gameplay, multiple online modes and excellent looks, this solid title delivers intense urban soccer action. While it's not nearly as elaborate or inclusive as the main FIFA franchise, EA's FIFA Street has brought some exciting, arcade style action to the football field. The third iteration on PS3 is no exception to this rule and offers a fairly enjoyable, if somewhat superficial experience. Instead of relying on realism, the game emphasizes speed and tricks on a variety of non-traditional pitches to make for a more accessible soccer title. The game features about a dozen international teams with several well-known players including Ronaldo, David Beckham, Landon Donovan and Michael Owen to name a few, which helps to create an authentic feel. Players can also unlock many additional players for each team. 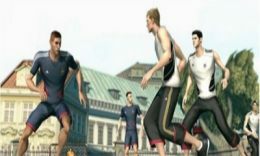 FIFA Street 3 sees these super star players participating in five-a-side matches on generally enclosed fields, making for a more intense game than you'd normally see from the FIFA series. Each team's roster features a variety of players and more can be unlocked as you complete tournaments and win games. These additional players generally bring new skills to the pitch which makes them more effective than you'd expect them to be. This gives players strong motivation to stay with the same team and keep playing, while also broadening the selection of players available, which seems quite limited at first. There are several different game modes available - you can choose to play a single friendly match, compete against other teams in several matches in tournament mode and set the special features and gamebreakers on or off in the game's options screen. Players can also set the match length, rules and different camera angles here as wel. When you complete and win matches in tournament mode, you'll be able to unlock additional items such as extra players, pitches and new ball-types. FIFA Street 3 also offers some decent online support for up to six players at once with a variety of modes available including standard and tournament modes as well. Overall, the game offers an acceptable number of gameplay options and modes that give it some legs at least. As you play through the game, you'll find that the pacing and gameplay is much faster than you'd expect. Playing FIFA Street 3 is a bit more intuitive than previous installments, since EA's developers have made passing, kicking and shooting much easier than in previous games. Using the controller is fairly simple and most players should have very little trouble learning the basics. Your team's AI is surprisingly intelligent and you won't have to worry about passing or switching players for the most part. Getting the hang of shooting is a bit more difficult than you'd expect, though you can generally score a goal if you are close to the net. Aiming the ball is fairly simple as well, and your opponents don't tackle as frequently as you'd expect. Of course, the gameplay is a bit faster on the pitch than normal, but that's to be expected. The rules are much looser in FIFA Street 3 than in standard soccer, and you won't have to worry about the off-sides and other annoyances. Instead of worrying about rigid formations and player positions, you need to learn to perform tricks and stunts, such as dribbling through the air, running across the sides of backboards and performing spectacular bicycle kicks. These moves are fairly easy to perform, with most used by rotating the right analog stick, pressing down one of the shift buttons or a combination of both. Chaining these together allows you to move the bar much faster, but this extra energy is vulnerable and recedes quickly if you don't make a shot on goal. When you do this, your energy gauge increases which can then be used to trigger what are called Gamebreaker events. When these are enabled, your team is given superhuman powers with increased speed and shots that are almost impossible for your opponents to deflect. On the other hand, when your opponents grab one of these, it can be annoying since they can score almost automatically. You only have a short time to use these gamebreaker moves, since the energy bar drains very quickly. Using these strategically is a key element to success, and it helps to position your players a few seconds ahead of time to maximize your goal scoring opportunities. FIFA Street 3's next generation debut brings many visual improvements to the series, with its newly brightened color palette the biggest change. As you'd expect from an EA title, the character animations and visuals are incredibly slick and appealing. The action takes place in a variety of different fields which range from tanker tops to beach-side resorts, there are more than a dozen different arenas where you can play with additional areas able to be unlocked. While there are only two different camera angles from the side view or a close in range, they both do an excellent job in presenting the action. The character/players also look more appealing thanks to their newly cartoonish appearance, which brings the series a much needed sense of humor. 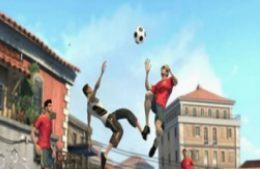 The game's urban sensibility is evident in the action sequences after you score a goal, where the action stops and a screen splashes onto the screen showing the goal-scoring player. Musically, FIFA Street's soundtrack is fairly excellent with an industrial/techno feel that compliments the action perfectly, with some truly thumping tracks used to punctuate the action perfectly. Unlike many other sports titles, you won't have to listen to stuffy play-by-play announcing, which helps to keep the action visceral and exciting. FIFA Street 3's production values are above average overall and do an excellent job of transporting players into the action. While FIFA Street 3 isn't as deep or realistic as a standard soccer title would be, it's still an enjoyable soccer game. Its deliberately streamlined gameplay makes it easy to pick up and play with its accessible controls and interface giving it instant appeal. The gameplay is faster and more frenetic, and this arcade-style approach allows players to focus on performing special moves and attacks. Building up a sequence of these unlocks the game breakers, which add a cool layer of fun and strategy to the gameplay. The game's cartoonish visuals and smooth animation give FIFA Street 3 an appealing look overall, and makes the game feel bright and fun. FIFA Street 3 isn't the deepest or most elaborate soccer title on the market, but it is an enjoyable and occasionally challenging game that should please sports gamers looking for instant gratification.